an older lady shouted to me above the traffic. I was making a dash against the light on a street in my small Midwest town. 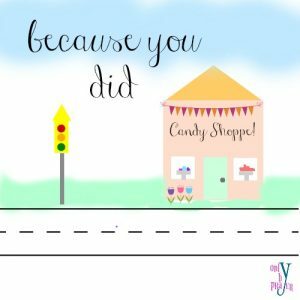 I turned my head and smiled a feeble apology to my fellow pedestrian as she dutifully scurried back to the curb, pulling her companion, who was in a wheel chair. Thankfully, they made it back to the curb before the pick-up truck rushed through the intersection. I beat the truck (I was in heels and a dress) and hopped up on the sidewalk. Safe. A play on words. Saw and blind. Sight and dark. When we are blind, the God of Light sees us. He looks into our darkness and sees our blindness. 3 Jesus answered, “Neither this man nor his parents sinned, but that the works of God should be revealed in him. 4 I must work the works of Him who sent Me while it is day; the night is coming when no one can work. Day and night. Dark and Light. The Light of the World speaks into the darkness and the darkness cannot overcome Him. Do you notice what Jesus uses to heal the blind man? 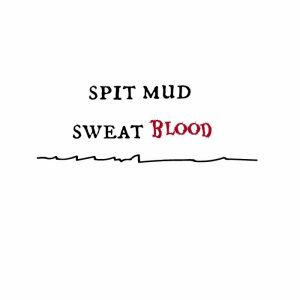 Dirt and spit. Two of the dirtiest elements on earth. In the hands of our Savior, dirt and spit bring healing and curing and hope and life. Who does that? Who takes dirt and spit and works miracles? The same God who brings water from a rock, bread from the wilderness, and life from death. The God who makes the limpers into leapers, the stutterers into speakers, the famished into reapers, He does that. That is how good how pure and clean and holy and powerful our God is. In His hands, dirt and spit are purified and powerfied by His holiness. God does the same for us. Vessels of clay made from the dust of Eden. The dirt of our sin mixes with the Living Water and we are mud in His hands. After He heals us, He sends us. From the pool of Sent to the lost of the world. Go, wash, and receive your healing from your Savior. How has Jesus healed you? Please leave me a comment. I’d love to hear from you. I’ve been talking and thinking about a spiritual growth mindset. It’s everywhere. What we think and how we think matters. God tells us in His word we are not to be con-formed to this world, but trans-formed by the renewing of our minds. We need to leave the fixed mindset which is motivated by fear and doubt, behind and live on the wild-side of faith aka Spiritual Growth Mindset. A spiritual fixed mindset means scarcity. Same old same old. A spiritual growth mindset is water-walking, giant-stalking, mountain-moving abundant kind of life. I want that. It’s the kind of mindset that pleases God. The lunch boy had it. 5 Then Jesus lifted up His eyes, and seeing a great multitude coming toward Him, He said to Philip, “Where shall we buy bread, that these may eat?” 6 But this He said to test him, for He Himself knew what He would do. He wandered out into the wilderness with several thousand other people to hear some preaching. He overheard Jesus talking to His disciples about feeding the people. The disciples were stuck in a fixed-mindset mode, so they gave nothing, not even offering the little they had. But the lunch boy had a faith that was as big as God. He took a risk and gave it all. 1 boy + 5 loaves + two fish + JESUS= 10,000 lunches. Talk about a spiritual growth mindset. Spiritual fixed mindset says I can’t. Spiritual growth mindset says God can. 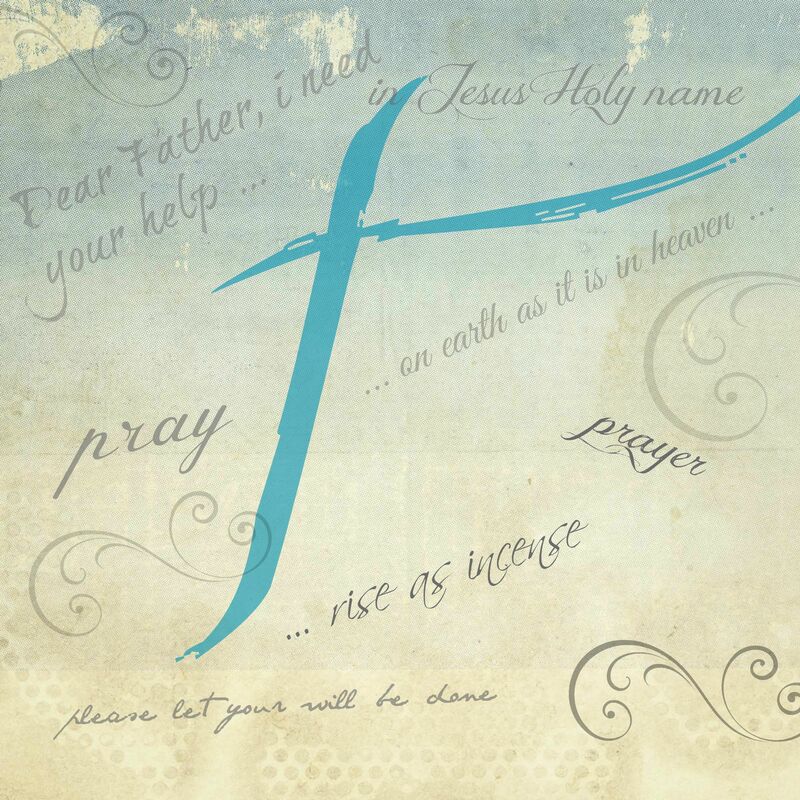 What do you have that you can give to Jesus? A little money? A little learning? A little house? A little talent? Take a chance, step out in faith and exercise a spiritual growth mindset and watch what God can do. 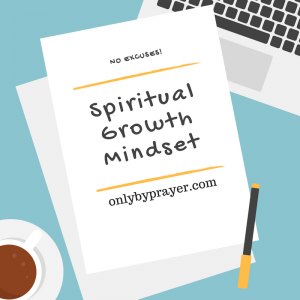 What do you think about a spiritual growth mindset? To read other posts in this series, please click on the links below! a person with whom one is friendly despite a fundamental dislike or rivalry (online dictionary). Do you have a frenemy in your life, someone whom you can’t seem to live with but can’t live without? You love and you hate. You laugh and you cry. 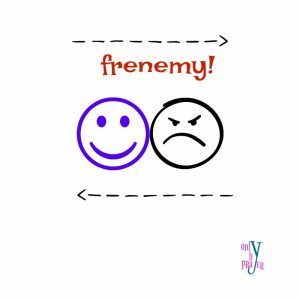 Are frenemy relationships sustainable let alone healthy? The Bible says not. Being a frenemy of God is marked by trying to be in two places at once, in the world and in the kingdom. It’s also marked by trying to be two people at once, a believer and an unbeliever. Torn in two. Standing on the fence. I used to be that Christian. When I became a brand new believer, my old friends were less than thrilled. I thought they would at least be happy for me, but my good news about the Good News was met by blank stares and nervous laughter. Confusion followed. I decided I could be the one person who could bridge the gap between the world and the Gospel, the cool Christian who could laugh with the sinners and cry with the saints. Not so. I ended up crying with the sinners. God clearly states it is impossible to be His frenemy. We must choose. Friend of the world or friend of God. We can love both, but can’t be both. Only One can be our friend. So how do we solve this problem? The Bible has the answer. We humble ourselves before God, whether we feel like it or not, and tell Him that our plan to cozy up to the world while following Him just doesn’t work. Humbling ourselves will be hard. It will seem like a huge sacrifice. But He is our great reward. 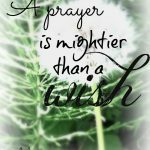 Humbly ask Him to help you want Him more than the treasures of the world. Stop fighting. Stop posing. Stop faking. Be what you were created to be. There’s a movie/book out right now that is causing quite a stir. Lots of people are talking about it; some are for, and some are against. Either way, the movie is a great conversation starter. Let’s start our own conversation about 13 Reasons Why … we need Jesus. He is the only way to God. No matter what anyone says, Jesus is the only way to God. He is the way the truth and the life, and no one comes to the Father accept through Him. If you believe the wrong thing, you are still wrong. If you sincerely believe the wrong thing, you are still sincerely wrong. He is the only way to heaven. We cannot be good enough, strong enough, work enough, or sacrifice enough to earn our way to heaven. It is only by accepting the life, death, and resurrection of Jesus Christ that we will be with Him forever. He is the only way we can be saved. All have sinned and have fallen short of the glory on God. It is by the death of Jesus Christ that we are saved from the consequences of our sin. We are saved by the power of His blood. He is the only way we are forgiven. 1 John 1:9 states if we confess our sins, He is faithful and just and will forgive us our sins and cleanse us from all unrighteousness. We cannot do enough good to “tip the scale” in our favor. Jesus is the only one who can forgive our sins. Jesus is the only one who can restore all we’ve lost. Jesus is the ultimate lost and found. Whether we’ve lost things because of our sin or the sin of others, Jesus can restore it all. Time, health, wounds, joy, sin, shame, suffering, and strongholds can all be restored by Jesus. Whether it’s been stolen, given, or wasted, Jesus can restore it. “God, your God, will restore everything you lost; he’ll have compassion on you; he’ll come back and pick up the pieces from all the places where you were scattered.” Deuteronomy 3:30. Shattered or slivered. Shards or fragments. He restores them all. He is the only one who heals: All of us are the walking wounded, playing hurt in the game of life. We carry our scars and lesions. So does Jesus. But His wounds are different; they heal. Only God can do that. Life from death. Healing from wounding. Health from hurt. Jesus is the only one who gives us purpose: In Christ Jesus every person has a purpose, not just your pastor, or the radio preacher, or the evangelist on the speaking circuit. God has specifically gifted and called you to be highly effective wherever he has placed you in life. Every job, vocation, or career is important to His kingdom. In Christ Jesus, you have purpose. Jesus is the only one who loves us! No one loves you like Jesus. Not your hubby, your wife or your mama. There is no end to His love for you. It can’t be measured, counted, contained, or restrained. You can’t make him love you more or less no matter what you do. He is the only one who can recycle all things for our good. God uses all things for the good of those who love Him, who are called according to His purpose. All things sinful, shameful, frightful, blissful, disgraceful, graceful, beautiful, awful. He uses all things –ful to fill use with His goodness. Jesus is the only one who will never leave you nor forsake you. Never. No matter how deep, how wide, how long the sin, the separation, the rebellion, God will NEVER leave you. Cross His heart and hope to die. Jesus is the only way we can be different. Apart from salvation, this is my top reason why we need Jesus. We. Can. Be. Different. Weak can be strong. The fearful can be courageous. The sinful can be made pure. 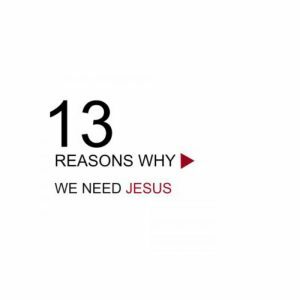 13 important reasons why we need Jesus. Which one is your favorite? Leave me a message below. I’d love to hear from you!